We have been talking about this project since last fall. We hope to retouch all of Canada's provinces this year and, at the very least, hit some of the "territories" where we never really have. 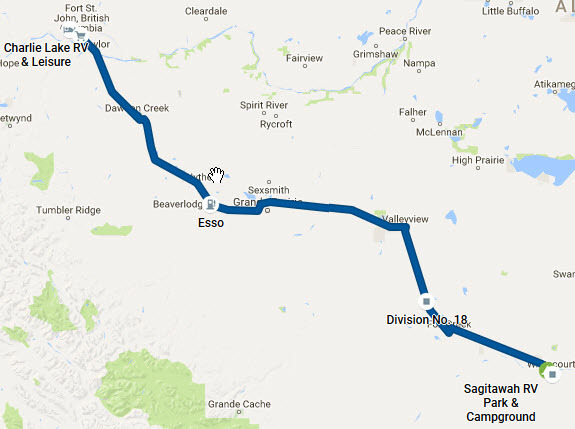 The first phase is to follow the TransCanada Highway from Montreal to Victoria. We have not done this since 1986. There will be stops to visit friend and family but mostly it is a trip to visit with our vast country. 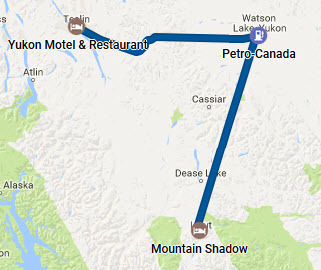 After exploring Vancouver Island a bit the plan is to head to the Yukon as our representative territory since the others present some special challenges accessing by road. Day 13 - June 2, 2017 - On To "The Island"
We hit the road a little after 10 AM. We pointed the Roadtrek along the A40/417/17 toward North Bay. Somewhere past Deep River we hit rain which persisted for the rest of the day. It was especially bad around North Bay. We finally ended up at Deer Ridge Family Camping and Cottages where we had a fine dinner from the galley and listened to the loons calling around Deer Lake after dinner. We thought we would get an early start especially when the "Deer Lake Airforce" made an appearance. The black flies were fierce! We were ready to pull out when we discovered we were caught in mud. We tried several strategies to escape but we were not advancing the project. The folks that ran the camp were still in bed so we decided to wait until the office opening hour of 08:00. In preparation Rod dug out the tow connector and put it on the front. By 8:15 our rescuer was up and had his big tractor over and we were on the road again. 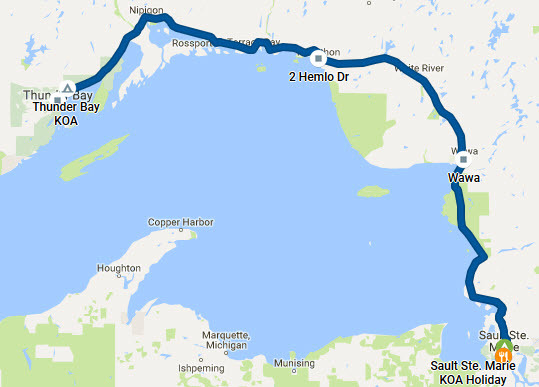 We set an initial target of the KOA near Sault Ste Marie but since the weather was still wet and we figured we would rather watch the rain on the road than sitting at a camp site we extended our target to our preferred plan of Wawa. The weather continue to be a bother. As we started along the north shore of Lake Superior, Mother nature added fog to the menu. The one good thing is the traffic was light all day. We initially had considered camping in the provincial park but, given the conditions, opted for Wawa RV Resort & Campground which was just off the TransCanada. We received a friendly welcome and were given a site. We headed down to it only to find a Roadtrek Zion SRT already there. It seems the owner had missed by one site. Since he was already set up, we took his site and we updated the office later. It is amazing, with the relatively small number of Class B motorhomes in the greater RV world that it would be almost the identical unit to our Zion - just a bit shorter. We had a nice dinner out of the galley and put our feet up. We hit the road from the Wawa RV Resort about 8:30 remarking to each other that we would readily stay there again. Nice facilities and nice people. We went into Wawa briefly to check out the latest versions of the giant Canada Goose statues. We also picked up some expensive gas and some bits to munch for breakfast as we rolled west. The weather was still pretty overcast but little fog and that only in the morning. We only had to put the wipers on a couple of times. We stopped at the Terrace Bay Lighthouse shopping area where we stretched our legs and picked up a few needed items. A short time later we pulled into one of the picnic area that the province provides along the route for a bite of lunch out of the galley. We made it to the Thunder Bay KOA Kampground about 4 PM with skies starting to clear a bit. We bought some wood and started our first campfire of the trip and broke out a bottle of Sandbanks Sleeping Giant 2016 that we picked up earlier to celebrate the lack of rain. After a dinner out of the galley it was actually sunny so Rod used the opportunity to give our Roadtreking Beardie a good grooming which was past due thanks to the "damp" weather. You can tell we are approaching the solstice and that we are at the extreme west of the time zone as it was still light after 9:30 PM. A slower start today. We took time to have a nice breakfast at camp before "pulling up stakes" around 9:30. We then wandered around Thunder Bay taking care of various needs (like getting $$) while we waited until a wool shop Lillian wanted to visit opened at 11:00. About 11:35 we finally pointed the Roadtrek towards Kenora. We crossed the "Arctic Watershed" (the point in Ontario past which all water flows to the Arctic Ocean) about 12:40 EDT. We were now in the Central Time Zone. Progress to Kenora was pleasant due to nice weather but largely unexciting. Again we made a lunch stop at one of the picnic areas. We finally made our way to The Willows RV Park & Campground just short of Kenora about 4:30 PM CDT. We were assigned a nice site handy to the free showers where we spent a pleasant evening. A few quick notes on the day. We were up pretty early so we took time to have a nice breakfast out of the galley. We hit the road about 08:00 heading, finally, for the Ontario border. Upon entering Manitoba we stopped at the provincial tourist information center to pick up the latest maps and guides. We decided at that point, since we were pretty early in the day, to head along 44 towards Selkirk so we could visit Lower Fort Gary National Historic Site. This was mostly the old route 1 which we probably used back in 1986 which was our last pass through the province. The day had started sunny but it had become overcast and windy since crossing into Manitoba. None the less we had a nice walk around the site and chatted with the young folks taking the interpretive roles around the place. We eventually got back on the road looping around Winnipeg to arrive at Winnipeg West KOA in early afternoon. As we settled into our site our initial impressions were that the "kampground" was a bit barren. Once the boys got off on their usual post arrival tour it became pretty obvious that the whole camp got pretty wiped out in the floods a year or 2 back. It looks like most of the campground had been under a meter or more of water. They seem to be doing a good job of rebuilding everything. All met our needs anyway. Rain had threatened most of the day but skies cleared by evening. Today we were both up and moving by 07:00 (Lillian up earlier since coffee was ready) but we did not set off until 08:40 after taking time for some breakfast. Our first target of the day was Fort La Reine Museum, Pioneer Village, & Portage Tourism near Portage la Prairie. It was a most interesting collection of buildings, machines and antiquities but it lacked organization. Items from varying eras were on display without any real indication of where they fit. They have the materials but lack the interpretation to really make it educational. Fun anyway. The best fun was watching a few families of gophers living on the property. Next we moved on to Commonwealth Air Training Plan Museum near Brandon. This was a much better effort though, like most such museums, is a work in progress by dedicated volunteers. This was a superb education opportunity. We set up camp at Meadowlark Campground & RV Park where we spent a pleasant evening. Today we woke up with a hankering for biscuits. Since we had some Bisquick in the pantry, Rod mixed some up for breakfast. Having satisfied that need we packed up and hit the road about 09:40. We originally had planned to head up toward Saskatoon visiting some sites on the way but we discovered that the ones of most interest such as Batoche National Historic Site were closed on weekends until July so we decided to postpone the northern loop until the return east and just head west along the TransCanada. Before moving on we stopped at a small market in Brandon were they were having an "Eco Day". We enjoyed wandering around and chatting with the folks. Since we had not been following the news much this past week (one of the joys of being on the road) we did not know that Saskatchewan had been suffering some big winds this week. We seem to have caught the tail of it with some very strong and gusty winds from the North which hit us a crosswind. While the Promaster is a stable vehicle for its size (10' tall by 21' long) it was hard to hold at the 110 KPH speed limit. Driving for the day was work. Another interesting occurrence was that the automatic time sensing of the Ram was confounded by entering Saskatchewan where they are on CST since they do not follow Daylight Saving Time. It is still scrambled but we adjusted to CST in anticipation of MDT. We arrived at Wakamow Valley River Park Campground in Moose Jaw, SK somewhere about 4 PM CST. It is a lovely place where were also entertained by a bunch of Brownies on a weekend camp out. All well behaved and energetic. We dined on BBQ steak, mashed potatoes and salad from our stash (not to mention some yeast-contaminated grape juice) and enjoyed a pleasant evening. The second week begins. It is hard to believe we have already been on the road for a full week. Today we plan to move camp to Drumheller, Alberta and the "Badlands" so we decided to hit the road early. This turned out to be 07:30 CST (MDT). The winds were much more civilized today even in the flat lands. It was not an exciting drive but we finally arrived in the west by spotting a number of Magpies. We also spotted deer, coyotes, bison and a number of raptors flying by. We arrived at Dinosaur RV Park in Drumheller at about 16:00 MDT and picked ourselves a simple site. We then headed back to town to Freson Bros. Drumheller to resupply the galley a bit. This included a rotisserie chicken to sacrifice itself for a simple dinner. We took a leisurely start to the day taking time for a nice breakfast before setting out about 10:00. Our first stop was the Royal Tyrrell Museum. We had last seen in 1986 so we wanted to see how it has evolved. It seems to have become a great educational center and their exhibits were excellent and well organized. We then took some time to wander about and see some of the extraordinary geography of the "badlands". We especially enjoyed the Hoodoos. Before leaving the area we called Rod's aunt and uncle in Calgary to see if they were available for dinner. No answer so we left a message and migrated down to Calgary West Campground near the TransCanada on the west side. We heard back about dinner and arranged to meet at their place around 5:30 PM. We did exactly that and after an initial visit in their back yard we headed off for a fine dinner at Involtini Ristorante. This restaurant allows you to bring your own wine subject to a corkage charge but the latter was waived on Mondays. 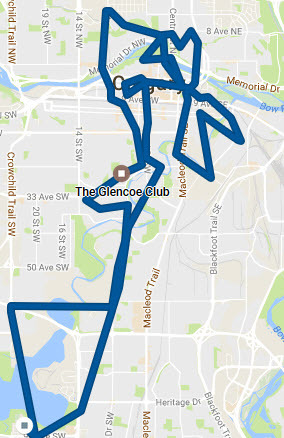 It must have been a Monday the last time we visited Calgary. We had a wonderful evening making our way back to camp about midnight. In spite of the late night we were on the road by 8:00. We planned to get a start then stop for breakfast in Canmore. We found The Rocky Mountain Bagel Company and settled into some lovely bagel based breakfasts with superb coffee. Before we left we bought 6 bagels and some cream cheese to repeat the joy on the road. Lillian then had a good shopping tour of the main drag while the boys kept her company and enjoyed the nice morning in the foothills. We finally got rolling again about 11:00. Our next stop was Lake Louise. It was lovely but a mad-house. There were hundreds of cars, busses, motorhomes and other vehicles in massive parking lots and thousands of folks wandering about. We had a look, took some pictures and a bit of a walk the beat a path out. We kept rolling along enjoying the views. As we passed through Golden, BC there was a sign to check our fuel giving the distance to the next service. The dumb thing was that the sign was past all the gas stations. Since our range was marginal we decided to backtrack and fill up though it took 5 KM to find a place to safely turn around. We set up camp for the night at Sicamous KOA. We took a slow start this morning. Rod caught up these notes and Lillian caught up some other tasks and some reading. We finally packed up and head out about 10:50. 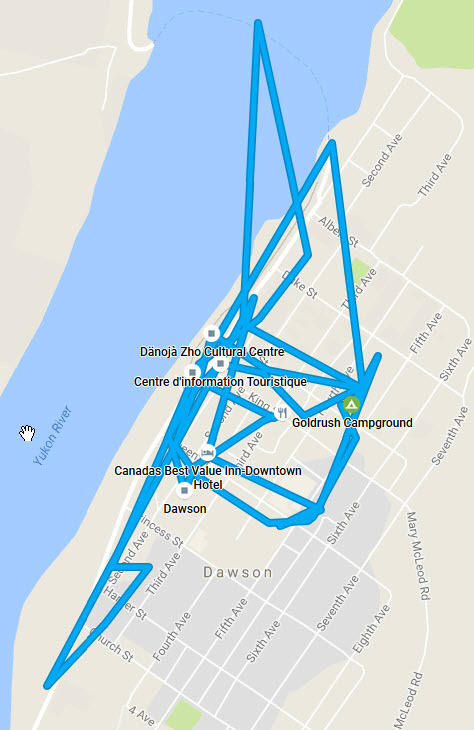 The target for the day was Kelowna as a first step of a tour down the Okanagan Valley. 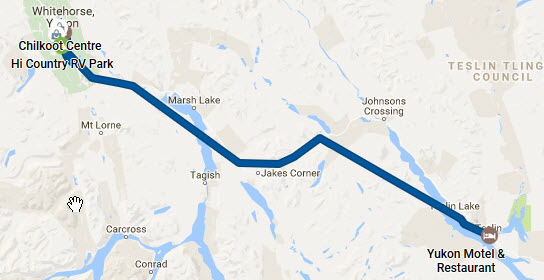 We cut off the TransCanada onto BC97A setting a course for Vernon and Kelowna. As we approached the town of Armstrong, BC Lillian spotted a road side sign for The Twisted Purl Yarn Studio so we dropped off in Armstrong to visit it. It was a chance for the boys to have a walk and Lillian found the item she had been seeking. 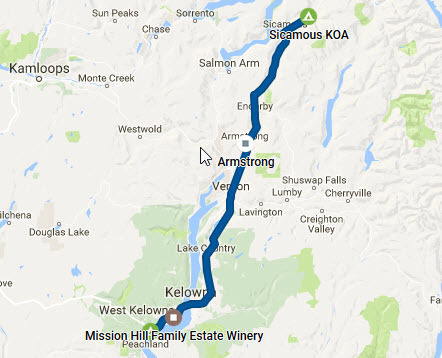 Our next stop was Mission Hill Family Estate Winery which was one Okanagan winery that we have known about for many years. We had a late lunch before visiting the store. The lunch and wine pairings were excellent but more than we could eat so we packed the rest. Lillian is still talking about that lunch. We then went hunting for a place to camp for the night. After several false starts we ended up at Todd's RV & Camping near the town of Peachland. Being a lakefront camp site they were suffering some flooding issues but were generally operational with space for us. We eventually made dinner from the Mission Hill leftovers. When we were at Mission Hill yesterday a couple of folks mentioned Summerhill Pyramid Winery which Lillian wanted to visit before we moved on. It opened at 9:00 so we took time for bagels and cream cheese from Canmore. Though it was a 25 KM backtrack, it was worth the visit and we added a couple of bottles to our collection and took note of some others for future consideration. Someone there mentioned Dirty Laundry Vineyards near Summerland. Since it was on our planned route we decided to have a look. It turned out to be great fun and they had some fine wines besides. We did not buy any since we are running out of space. You will get a better idea from the pictures. We then worked our way down to Osoyoos enjoying the fascinating geography in spite of periodic rain. This area is as close as anywhere in Canada to a desert yet the 2 times we have driven through (last time in 1986) it was pouring rain. Mother Nature is weird sometimes. At that point we picked up route 3 towards Hope to rejoin the TransCanada. We got as far as Hedley where we found Gold Mountain R.V. Park & Cabins and decided to take a break since the rain had stopped. The folks are really nice and the campground pleasant. Rod finally got a chance to groom Weston and we both had a shower. Some wine by the fire wrapped a most interesting day. Today we wanted to catch the ferry from Tsawwassen to Swartz Bay before the weekend. Since we stopped a bit earlier than we originally planned we tried to get a quick start. We were mostly successful getting on the road by 08:00 after a pause to dump the "ugly tanks". We figured that it was only fair that after we took a full fresh tank of their lovely mountain artesian well water that we leave something in return. It was largely a pleasant trip. There was some degree of "driving work" but we were compensated by amazing scenery. We were held up at one point by an 18-wheeler that managed to tip over on a curve dumping a load of lumber. We arrived at Tsawwassen about 12:30 and were able to get on the 13:00 sailing. We indulged in a good lunch on the way over to the island. 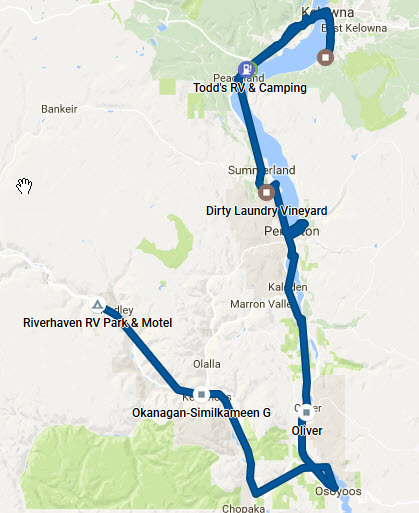 We arrived pretty much on schedule then we then worked our way over to Victoria and set up camp at Fort Victoria RV Park, a large RV park within the city limits. While it does not have the beauty of a rural camp, it is neat, functional and convenient to the city. Rod texted a cousin in the area and he has invited us to drop by for a BBQ tomorrow - sounds great. We relaxed for the rest of the day while Lillian ran some laundry through the machines at the camp and Rod looked at some plans for exploring the island in the coming days. Today we had some time to exploit until it was time to head to the family gathering around "mid-afternoon". While checking Email we noticed a monthly mailing from Spinnakers Brewpub & Guesthouses which we had been receiving since we stayed at their guest house back in 2010. In this one they were talking about their "Brewers Breakfast" and the bacon in it. Since it was on our way to downtown Victoria we decided to check it out. Turns out it was grand. Being well sated, we moved on to downtown. Lillian especially wanted to drop in to Munro’s Books, one of her favorite bookstores anywhere. Rod dropped her at the door and went off to find some parking and catch up at the bookstore. We made a thorough exploration of the store and had a great chat with some of the staff before departing with a couple of books in hand. Over the next couple of hours we shopped around (moving the Roadtrek once to stay out of parking faults) during which time Rod acquired a walking stick he had been looking for after trying to navigate some icy walks in Lake Louise. We then wandered east along Pandora until we merged into Oak Bay avenue then swung onto Beach Drive and followed the coast until we came back through Victoria and over the bridge to Esquimalt. We eventually popped in to a grocery store to buy some bread and a couple of other items, made some sandwiches and enjoyed a light lunch. It was now time to head to Rod's cousin's place which was nearby. We arrived to find his parents (Rod's aunt and uncle who live about a KM from us in Pointe Claire) were visiting and were already there as well as their granddaughter and great-granddaughter. We had a great afternoon and evening as various friends and the cousin's sister popped in and out. Great food, great conversation and great fun. We eventually rolled off to our home on wheels which was parked out front for the night. Lillian got up around 07:00 and took Weston for a walk around the neighbourhood then made a pot of coffee. Rod finally came to about 08:00 and we headed in to the cousin's place and chatted with his partner for a while. The previous day it had been arranged by the aforementioned granddaughter that she and her new husband would be meeting her grandparents and ourselves to head off for a lunch at Unsworth Vineyards in Mill Bay. All went largely as planned and we tasted some interesting wines and had a lovely and interesting lunch. We then all moved on to Cherry Point Estate Wines to sample some other wines. Some interesting wines but no purchases. 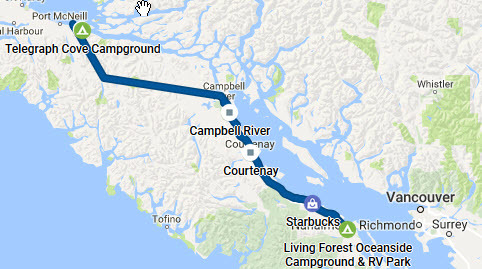 We now parted company and we headed north towards Nanaimo and set up camp at Living Forest Oceanside Campground & RV Park where we relaxed, took some nice walks, had a light dinner, sat by the fire then Rod finally caught this travelblog up a bit. It was a fascinating drive as you will see from the pictures. We stopped for a snack at a roadside stand near Sayward where we met another couple with a cute dog in a class B - a 2006 Pleasureway. We had a good chat - they were from Salt Spring Island and had just been up to Telegraph Cove. We got to Telegraph Cove just before 16:00 and popped into the General Store for a couple of items. It took a bit to sort out available RV accommodations since the area near the town seemed a bit barren and uninteresting. We found out that there was The Forest Campground forest site that was much more appealing. In fact it was amazing! Since there was some dining options handy we decided to dine at Old Saltery Pub. After a good dinner and some interesting conversations with some visiting Australians we headed back to the camp, lit a fire and relaxed for a while and enjoyed the amazing environment. The one problem is that the WiFi service is poor and cell service is all but non-existent at the camp so upload of pictures will be delayed. When the day started the plan was to follow 19 back towards Victoria with a view to setting up camp near Sidney and catching an early ferry back to Tsawwassen in the morning. When we were exploring yesterday we noticed that the Seahorse Cafe served breakfast starting at 08:00 so we arrived for opening, had some nice crepes and were on the road by 08:45. We made good time heading back down 19 only stopping at the Costco in Courtnay for some less expensive gas and a rest area to make some sandwiches. As we approached Nanaimo we noticed from the electronic signs that neither ferry had any wait issues. Being the impulsive types we are we figured we could save at least half a day and a bunch of gas if we grab the ferry to Horshoe Bay. So we texted the island family to update them and we caught the ferry just after 15:00. Back on the mainland we set a course up route 99 to Squamish where we set up camp at WhistlePunk Hollow Adventure RV Park about 17:30. The objective today was to make it up routes 99 and 97 to about Williams Lake. We got rolling about 08:45. The initial track from Squamish to Whistler and on through Permerton on BC 99 was pretty and not to hard driving. The next stretch up to Lillooet was very hard driving but we would do it again for the amazing scenery. Some of Canada's best! Through most of the most challenging part of the drive we found ourselves immediately behind another Roadtrek Zion. We also noted that it came from the same dealer (Roulottes Ste-Anne in Terrebonne, QC) that we got ours. We actually got a chance to speak with them briefly - they also picked up the same month (August 2016) that we did. What are the odds? The drive after Lillooet got easier - especially once we picked up BC 97. We were almost in desert now. A lot of ranch land as well. It was warm out - hanging around 30° C.
We set up camp at Wildwood Campsite just past Williams Lake. Our hosts, Wayne and Norma were delightful. At their suggestion we ended up at Sir Bob's Fish & Chips for a lazy dinner. Back at camp Lillian got her nose in a book while Rod did some trip planning, chatting with folks around and getting some of this travelblog caught up a bit. Unlike the Lee Hazelwood song made famous by Dean Martin we actutally did not go back. More like we ended up in Houston, BC. We set out from Williams Lake a little before 09:00 after breakfast and grabbing a fill of gas across the street. We set course for Prince George so we could stock up on food and some other supplies. 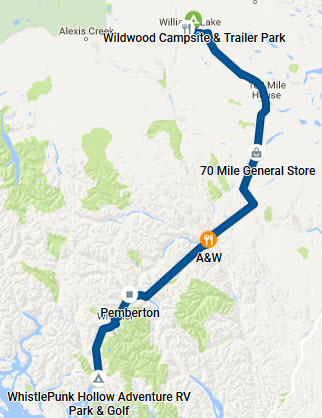 We then picked up another one of the TransCanada segments known in BC as Yellowhead Highway 16. The day was relatively easy driving through farming and ranch country. There was some rain on the way but compared to some other areas of the province the weather was tame. 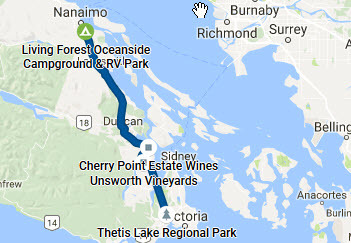 We had initially set our sites on a RV "Resort" just past Fort Fraser which I will not name. We had a brief look around and found the place to be a bit of "a dump" in spite of its nice lake side location. 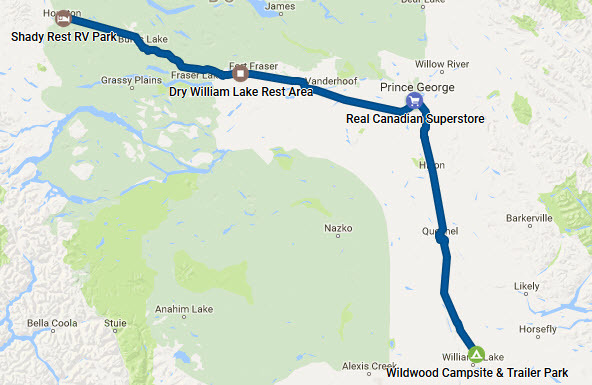 Since the weather was unexciting for hanging about camp we decided to put a couple more hours of driving behind us so we picked a target near Houston, BC since there were actually a number of camps to choose from. 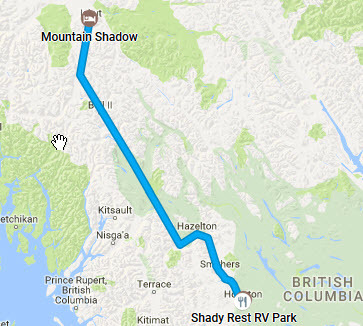 We decided to check out one of the "alternates" that was a couple of KM short of our current target and we found Shady Rest RV Park. One look told us we were staying if there was room. A lovely spot, very clean with free showers and excellent Internet service. Probably the nicest we have stayed at since Telegraph Cove. It has been raining on and off since we arrived so we settled in to a pleasant evening in the Roadtrek. Just noticed that the twilight is finally fading at 22:30 and we are only at 55° N.
We were packed up and on the road by 07:45. Our target for the day was near Iskut so we had miles to make. To fortify ourselves we stopped at the Pleasant Valley Restaurant for a great breakfast before fueling up and really hitting the road. It was still raining and it continued to rain on and off most of the day. We turned north onto "The Cassiar" near Kitwanga and continued trying to escape the rain. We finally lost it around Bell II. We pulled into Mountain Shadow RV Park and Campground just before 16:00 as planned for a change. Rod give Weston a quick grooming the we retreated inside the van for dinner etc. It was pretty breezy out but at least it was not raining and the view was magnificent. Today was our day to finally make it "North of 60" which is the degrees of latitude that defines the border between the provinces and the northern territories in Canada. In this case we were heading into the Yukon Territory (YT). Our only other time being anywhere in the "Territories" was at the end of September 2010 when we took the White Pass and Yukon Route from Skagway, Alaska to a few meters into the Yukon before it turned around and took us back to our cruise ship. 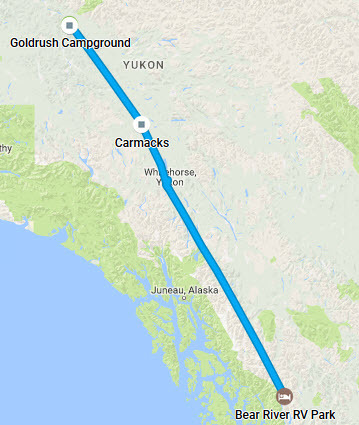 We hit the road about 08:00 and made our way up the last part of "The Cassiar" to where it met Yukon Route 1 also known as "The Alaska Highway" or more properly the Alaska-Canadian Highway or ALCAN Highway. Rather that immediately head west to Whitehorse, we backtracked about 20 KM to Watson Lake to gather some travel information and see the famous Sign Post Forest. We also dropped into Kathy's Kitchen for a bite of lunch and discovered Yukon Gold beer by Yukon Brewing - a fine pale ale. We then got back on the Alaska heading west. We drove through quite a bit of rain but finally worked our way clear of it as we got well down the road. 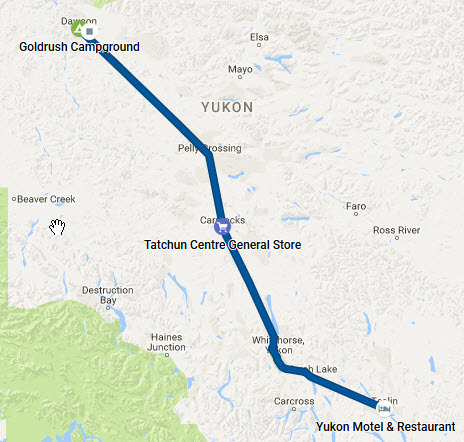 After finding some closed and otherwise unacceptable options for the night we ended up at Yukon Motel and RV Park near Teslin. While the esthetics of the RV Park were not all one could want, everything was clean, functional and organized. They also had a nice restaurant which was a perfect "goof off" for a couple of tired travellers. We wandered back to the RV and enjoyed a lazy evening (no doubt encouraged by a good meal and more Yukon Gold). We rolled off before the sun which stayed up until almost 11:30 PM. Today Lillian was up early though not as early as the sun which rose at 04:30. She used the time to catch up the laundry. We were packed up by 08:30 but, after filling up at a 4 cent per liter discount, went back into the restaurant for a great breakfast. Back on the Alaska we covered the remaining distance to Whitehorse, the capital of the Yukon. Our first stop was S.S. Klondike National Historic Site. After enjoying the exhibit we walked over to the Yukon Welcome Center to gather travel information and a coupon book that allowed Lillian to go back to the Parks Canada shop and buy a couple of T-shirts at half price. We next visited MacBride Museum of Yukon History which was most interesting. While we still had time on the parking meter, we took a walk around Whitehorse and dropped into Burnt Toast Café and split one of their "Burnt Toast Grilled BLT" and sampled some more Yukon Gold. Out next stop was The Yukon Transportation Museum with its Canadian Pacific Airlines DC-3 wind vane out front. Check out the pictures when they turn up. We figured that it was time to find a place to camp since most we passed looked pretty full. Our first choice was Hi Country RV Park and they turned out to have a couple of places left for smaller units like ours. We set up camp, made a late dinner then Rod finally caught up the last couple of days in this travelog. Today our objective was Dawson City. We were on the road by 08:00 rejoining "The Alaska" just far enough to pick up route 2 or Klondike highway toward Dawson City. It was a largely uneventful drive other than the usual variable weather. All things considered the road was fairly decent though the last half was suffering some post-winter blues in spite of the best effort to the road teams to patch and mark the more challenging parts. The biggest challenge on the way up was when we stopped at a rest area to make lunch and were invaded by a major airforce of mosquitoes. We are still trying to rid ourselves of the last few. We got to Dawson a bit before 15:00 and decided to take a spot at the Gold Rush Campground which is walking distance from most attractions in town. It is basically a parking lot for RV's with power and water but the facilities are decent and well kept if a bit crowded. We spent the rest of the afternoon wandering around town eventually popping in to Sourdough Joe's for a quick dinner. After dinner we poked around a bit more but most things were closing so we headed back to camp to feed and walk the Roadtreking Beardie. As 7 PM approached we wandered over to Diamond Tooth Gerties to make our contribution to the Klondike Visitors Association and catch the 8:30 PM show. The place was fun and the show was decent. About 9:45 we decided to wander back to camp. It still shocked us to open the door to bright sunshine. As I write this it is 23:10 and it is still quite bright out. We decided that since we had come this far to see this memory of the Klondike and other Yukon development activities that we should spend another night in town so we "extended our lease" on #7. After a bite to eat our first plan was to get on the Dawson Then and Now - Guided walking tour put on by Parks Canada. It was really well done. There was a basic tour guide as well as a character actor playing "Mme. Émilie Tremblay" an important character in the town's past. That part was exceptionally well done! We then toured some of the historic sites (and shops). We also met a couple in town with Roadtrek Zion. It turns out they are from Nova Scotia. We had a great chat exchanging experiences and ideas. We then headed back to the Roadtrek to check on Weston before heading out on the Klondike Spirit for a river view perspective on the city and its history. We were joined by 17 folks from a Holland America land and sea tour as well a a number of "strays" like ourselves. Again this was a well done tour - both educational and fun. We then took a bit of a wandering path back to camp and relaxed and chatted to some of our "neighbours". For dinner we decided to head back to Diamond Tooth Gerties based on the advice of a number of locals. Rod had snacked on a hot dog there last night and had noted the relatively extensive menu of snacks and meals. Lillian had their Ribeye Steak for $19 and Rod their Meatloaf for $15. Both meals were generous and exceptionally good. We made some further donations and watched the early show before migrating back to camp in bright sunlight. We had a great day but we had done a bunch of walking and were bushed. Time to start heading back towards home albeit in a leisurely fashion. We left camp about 07:30, stopped to top up the gas tank then hit the Klondike Highway back south. It was a day of driving and enjoying the scenery. The first half of the day was beautiful but cool weatherwise and there were few surprises since we had come up the same route. As we were heading south we saw a large number of motorcycles heading north in singles and groups all day. We presume they were all heading to The Dust 2 Dawson Motorcycle Ride (Not a Rally!). We figure they will have a great success and we are probably just as well heading south. It is going to be a crowded little town! We were initially thinking heading to Hi Country RV Park where we had stayed a couple of nights previously but since we made it there by 14:00 and the weather was not conducive to bumming around camp we decided to roll another couple of hours to revisit the Yukon Motel and RV Park near Teslin. We figured that dinner at their restaurant would readily compensate for the extra time on the road. We were right! The only bummer is that we picked up a rock ding in the last 5 KM. Hopefully we can get it patched up tomorrow. We set out about 08:10 after a good breakfast, topping up the gas at $0.04 per liter discount and picking up one of their cinnamon buns which will make breakfast for Lillian for 2 days. We progressed our way back to Watson Lake without much problem and stopped briefly for gas before finally getting on some untravelled road. Not long after leaving Watson Lake we fell below 60 and picked up BC 97 - still the Alaska. It was a good day for critter watching. We spotted a few bears, a coyote, a female moose with a calf and quite a few bison to mention a few. There was also a fair amount of road construction but nothing to severely impact the drive. 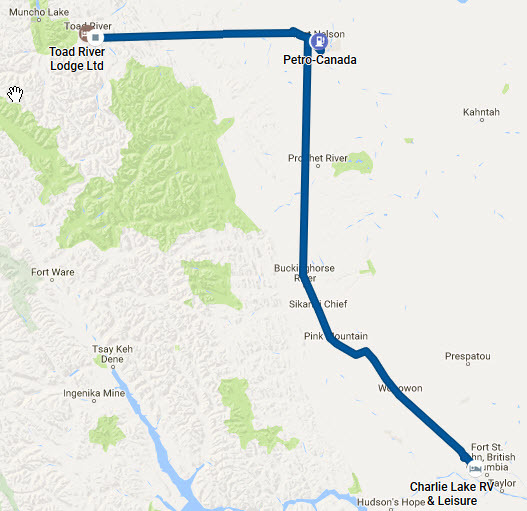 We finally set up camp at Toad River Lodge at Toad River, BC. What a lovely spot! We had a lakeside back-in lot with full services for a reasonable price. Showers, firewood and Internet were free. We had a great dinner in their restaurant and spent a nice evening chatting fireside with a couple from Arkansas. We also saw a female moose in the lake as well as many birds and waterfowl in the area. One of the nicer spots. We had Fort St. John, BC area in our sights for the day since there were many RV Parks in the area after a lot of nothing. As a result we got on the road at a decent hour and just kept pushing on. There were some areas of mountainous driving and we saw a couple of mountain sheep early on and a black bear later in the day but there was little excitement besides that. We stopped at the visitor center in Fort Nelson, BC to assess things and also topped up the gas before heading on. We ended up at Charlie Lake RV & Leisure just a bit short at Fort St. John. It was not the fanciest place we have stayed but the price was reasonable and the site was nice. Lillian caught up the laundry and Rod gave Weston a good grooming to round out a lovely, sunny afternoon. We had a light dinner from the galley, spent some time by the fire then packed it in afer a lovely sunset around 10:30 PM. It is still twilight as I write this at 11:00 PM. Not an exciting day today - mostly covering ground. We set out at 08:40 following our way down the last of "The Alaska" with pause in Fort St. John to replenish the galley and the gas tank. 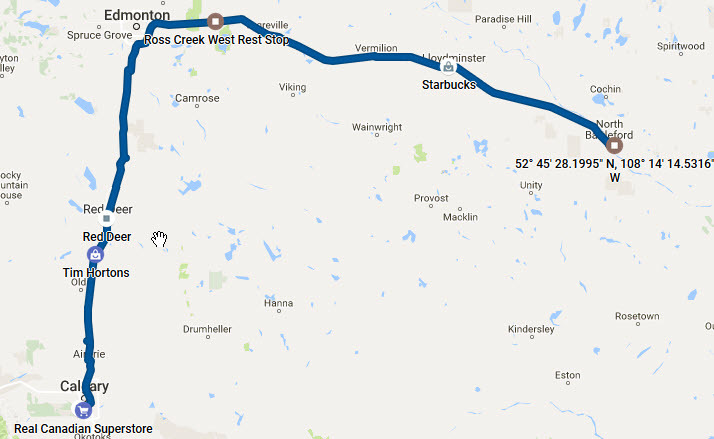 At "Mile 0" in Dawson Creek we picked up BC route 2 becoming Alberta 43 and followed it to Whitecourt, AB. The drive was generally good in generally decent weather outside of some gusting crosswinds at points. On the other hand, it was not exciting either. We set up camp at Sagitawah RV Park & Campground which we found a decent value. Before we set out on the trip Lillian stated her desire to see West Edmonton Mall. She had heard about it for years and, being a dedicated shopper, she needed to see it for herself. In all fairness, it is quite the center with its wide selection of shops, entertainment attractions and places to eat or dine. We set out about 08:40 and arrived about 10:45 just in time for most things opening at 11:00. We had a leisurely tour of most of the more shopping related areas while taking a peek (and pictures) of many of the attractions. We finally wandered off about 14:30 since it was getting a bit warm in the sun so we did not want to leave Weston too much longer. Up to this point the temp inside the van was holding about 20°C with the fan on but would creap up soon. We each came out with a hat and Lillian a pair of slacks. 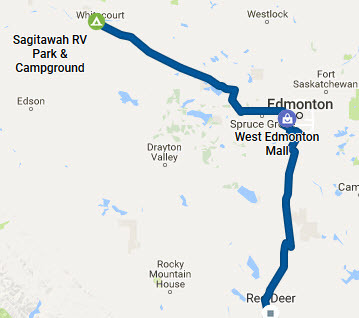 We then set course for Red Deer and decided to stay just on the south side of town at Westerner Campground, an RV Only Campground only situated in south Red Deer. For a relatively urban campground it is pretty decent though traffic noise is a bit annoying sitting outside. We fired up our bitty grill and cooked a steak we picked up in Fort St. John and matched it with some microwave mashed potatoes and some leftover coleslaw. Excellent! As we got back into Alberta we established contact with Rod's Aunt and Uncle who we spent an evening with on the westward leg of the trip. It was agreed that we would swing back to Calgary for another visit before we continued back east. Rod's Aunt also mentioned to Lillian that there was an interesting outlet mall CrossIron Mills which was on our way as we came down route 2 from Red Deer. She mentioned that there was a Bass Pro Shop to keep Rod happy. Needless to say we stopped at the mall on our way down and explored it thoroughly. Rod even had time to briefly pop in to the Bass Pro Shop even though we were running a bit late. On our way to our final destination for the day we also took time to get the oil changed on the Roadtrek before it complained at an inconvenient place. We arrived at Rod's Aunt and Uncle's place and picked up where we left off a couple of weeks ago. On the last visit we noticed that their driveway was level enough up near the garage to allow us to sleep comfortably though sauteing anything in the galley would involve some fat chasing. We shared a fine dinner and a pleasant evening before we crashed in the Roadtrek. Today was a wonderfully lazy day! We gathered for a nice, leisurely breakfast at 08:00 and set out a bit of a touring plan for the day. The objective was to bring us up to date with all the changes since we explored the area in 2010. It was a perfect weather day for the mission and we had a great time. We stopped for lunch at a sports club where they have been members since their first move to Calgary in the 1970's. We returned to their place eventually, relaxed for a bit then shared another wonderful dinner and evening. We finally rolled off to Roadtrek about midnight. Back on track today. 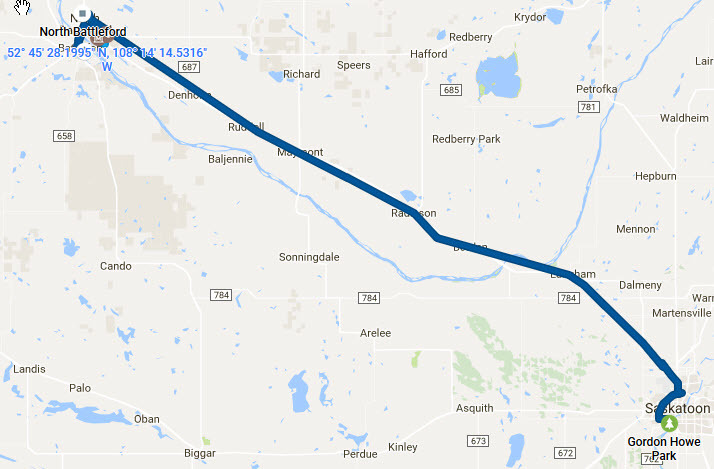 Our plan was to return through Saskatchewan on a more northerly track so we set course for Lloydminster, AB or SK. Before leaving Alberta we topped up our gas and wine supplies. As we passed through Red Deer where we swung off route 2 to address the wine need it was obvious that they had suffered a significant wind storm overnight - turns out it may have even been some tornadoes. Even today the winds have been significant as we moved up route 2. Once we turned east they were less problematical since they were tail winds rather than cross winds. After Lloydminster we continued along the more northerly verion of the TransCanada highway known as route 16 to "The Battlefords" where we set up camp at David Laird Campground. While we were in the Battleford area we wanted to enjoy some of the museum and historical sites. We first headed off to Western Development Museum - North Battleford since it within a couple of KM of where we staying. It is one of about 5 locations where collections have been established. This was an amazing collection both in interior exhibits and a wonderful village exhibit. See the web site for more information. We were very impressed with the whole thing in spite of Mother Nature providing another day of cold, gusty winds. The locals are trying to convince us that this is not normal though it was also gale season when we passed through the province heading west. Our next visit was to Fort Battleford National Historic Site which was back on the Battleford side of the river. It too was an interesting insight into the early days of the Northwest Mounted Police and some of the native uprising. At the root of so much of this was that habit in most of North America of considering treaties to only enforce obligations on the natives and that any corresponding conpensatory arrangements to be optional. The exhibits were interesting in spite of the seemingly gale-force winds. Eventually we moved on down the road after a bit of food shopping. We ended up in Saskatoon at Gordon Howe Park. This is a beautiful park right in the city of Saskatoon. Lillian caught up some laundry then we enjoyed a great dinner. We got back on the road about 09:00 heading on down the Yellowhead Highway towards Manitoba. Overall it was not a particularly exciting day other than one event that we could have lived without. We got hit by a rock again a couple of hours out of Saskatoon and this changed our need to get the windshield patched to needing to get it changed. Fortunately the windshield seems operational. We continued on to Yorkton, SK where we stopped at the only Speedy Glass in town for a chat. He took a look at our latest and offered the opinion that we could keep rolling since he did not have the part handy enough to replace it today and most windshield repair folks would be off until Monday. He did confirm that replacements were available in larger centers. So we resumed our plan and rolled on to set up camp at Minnedosa Beach Campground. We got back on the road about 09:00 having slept in a bit thanks to the time change from Saskatchewan. We woke up to gray skies with rain starting as we packed up. It continued to rain until we were out of Manitoba. Winds were gusty at points but nothing like on the trip west. We got to Kenora about 14:00 CDT so we took some time to poke around town. We also made a stop at the LCBO where we were delighted to find some remaining "2015 Sandbanks Sleeping Giant" which was perfect to replenish our supply of red wine. We finally made our way back to The Willows RV Park & Campground where we stayed on Day 4. We even got the same site conveniently just across from the free showers. The only thing we forgot is that cell service is all but hopeless and the WiFi is painful or worse. Never the less we enjoyed a good "clean out the fridge" dinner to go with "The Giant" and were able to enjoy some time by the campfire. Lillian was up early today to enjoy a free shower. By the time she chased Rod out of his back corner it was starting to drissle so we decided to pack up before things got wet. We hit the road about 08:30 and stopped about 10:00 at Patricia Inn Family Restaurant in Dryden to get a break from the continuous rain. It was an excellent breakfast which set us up to tackle more rainy KM's. We arrived in the Thunder Bay area about 15:30 EDT after giving back another hour we borrowed on the trip west. Since the rain had stopped a bit we did some food shopping then picked up some chicken and ribs from Swiss Chalet before heading to Thunder Bay KOA Kampground to consume it. It is still raining on and off so no campfire tonight. At least Internet access is passable though not as good as on the trip west. The fact that the park is much busier than in May might have a bearing on that. We were up and on our way by about 07:30 since we wanted to check in at Speedy Glass in Thunder Bay when they opened at 08:30. It turned out that they figured they may be able to get the windshield by late Tuesday and replace it Wednesday. We decided to roll on in hopes of finding a faster turn around in a less remote location. Initially we set course for Wawa. It was actually a beautiful driving day so we were enjoying our time on the road. We got off briefly in Marathon to give Weston a break and grab an early road-munchable lunch. We got to Wawa about 2 PM. The weather was still nice so we decided to continue a couple hours more to Sault Ste. Marie. We topped up the gas tank and booked the night at the Sault Ste. Marie KOA using their tablet app. We arrived in the Sault Ste. Marie area a bit after 4 PM so we stopped at the Speedy Glass there where Dan Duffy and his team arranged for a windshield to meet us at one of the Sudbury franchises tomorrow afternoon. With any luck that will be the end of the windshield saga for this trip. While the day had been generally beautiful weather-wise, it started to rain as we approached "The Soo". We checked in at Sault Ste. Marie KOA but decided to see if we could find an alternative to dining in the Roadtrek. A bit of research turned up Gliss Steak & Seafood housed in the local Comfort Inn. We split a Surf and Turf that was excellent washed down with a bottle of Niagara wine. Since we were expected at Speedy Glass® Sudbury East there where Kevin and his team were expecting us for an afternoon appointment we hit the road before 07:30. It was a generally nice drive other that the last 50KM or so before Sudbury where there was a lot of construction work. We made it to Speedy Glass® Sudbury East just before noon and met Kevin and his team. After some preliminary checks it was determined that they would be ready to start about 14:00 so we were free to pursue other interests until about 13:45. Since we were not particularly hungry having muched a late breakfast on the road we decided to go pay our respects to The Famous Big Nickel since we had not taken the time on the way west and we had not seen it since 1986. On the way there we spotted a sign for OLG Slots at Sudbury Downs and Lillian said that would be the perfect place for her to wait during the 2-3 hours needed to change the windshield. So, after taking some pictures of the Big Nickel and Lillian taking a tour of the gift shop we drover her to the casino and Rod made it back just in time for the appointment. The windshield change was uneventfull - a group of pros doing their job. We also had them change the wipers and put a water repellant coating on while they were fussing with it. They finished a little after 14:00. Nice folks and what appears to be a good job. One way to get rid of the bugs on the windshield! We picked up Lillian and headed for Sturgeon Falls KOA where we had reservations for the night. It poured rain most of the way there so we thought supper was derailed again but it stopped and cleared as we arrived. We had a nice steak done on our mini grill chased with some fine wine. So ends the saga of the rocky windshield. We started the day without a clear idea where we would end up but we did want to see the big Lift Lock at Peterborough. Rod had already spotted Twiggs Coffee Company in North Bay which seem to have a similar flavour to the Coffee and bagel place we found in Canmore, AB. We decided that would be a great breakfast stop since we were in no special rush being within a day of home. It turned out to be quite decent and a chance to grab a half-dozen Montreal-style bagels and some cream cheese to extend the joy. We then set course for the Peterborough Lift Lock which is Lock 21 on the Trent-Severn Waterway. It is an amazing piece of ingenuity and engineering. Unfortunately we were not able to see it operating. Before getting back on the road we discussed whether we just wanted to go as far as Rice Lake or whether we wanted to push an hour or two further to Prince Edward County. We elected the former after checking whether there was space at Golden Beach Resort where we had stayed previously and which had a restaurant called The Boathouse right on site. It seems they were happy to have us again to we set out in that direction. We arrived around 5 PM but were not especially hungry since we had stopped at a "chip truck" earlier in the afternoon. We booked a reservation at the Boathouse for 19:00 and decide to relax for a bit. Since we had some time and the picnic table was dry we took out the mat from the Roadtrek and put it on the table. Weston promptly put himself on the mat and we were able to finish the rained out grooming from a few days back. Dinner was decent - we foraged on appetisers washed down with a bottle of Sandbanks Baco Noir 2014. We woke up to rain for a change ;-S.
We snacked on some bagels and cream cheese while we checked the forecast for the county and availability of camping nearby. No joy on any of the above so we decided to head home with a small detour into "The County". We also wanted to gas up at the Mohawk Duty Free Centre on route 49 heading to Picton. We arrived there just as the van's "feed me" light came on. Having fed "the beast" we headed through Picton and on to Waupoos Estates Winery where we wanted to pick up some items (mostly liquid). 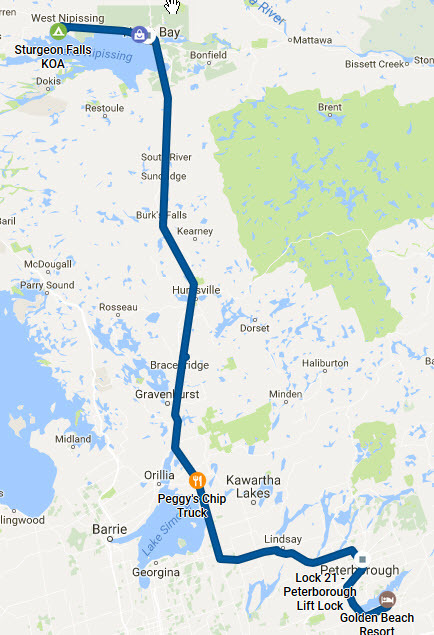 We then head back through Picton to route 49 on to route 401 since the Genora Ferry was on limited operation due to high water levels. Beyond a brief stop for a last gas top up in Lancaster, it was a staight drive home. The rain the we started the day with followed us all the way home. We arrived back home around 16:00. It has been quite the trip! I uploaded a bunch of pictures on May 25 and again June 7 and 15 since I was at campgrounds with functional WiFi albeit slow. The rest were uploaded since we got home. They need a lot of cropping and culling not to mention captions and conversion to slide show format. Now that we are home I am working my way through the clean up. About half the "cull & crop" has been done and those have also been made available as slide shows. The captioning has yet to be started. I hope you can make some sense of the pictures to help enhance the text.